Even as a motoring journalist, I always look at other media outfits for inspiration and ideas. My favorite is Speedhunters followed by The Narita Dogfight, and a few other automotive websites and blogs that devote themselves to car culture as a whole, heavily slanted toward the enthusiast community. Regular perusing of such websites made me familiar to the words Daikoku, Umihotaru, and Tatsumi. And upon further research, I found out that these are names of rest stops or parking areas popular among car enthusiasts in Japan. The other thing that piqued my interest was: Why all three in that sequence? I never thought I would find the answer, let alone go to these places, in my life. But as life would have it, plus the power of Facebook and the internet, I was able to check out all three places and find out their unique connection. I'm with a few friends on a trip to Tokyo Auto Salon 2018. 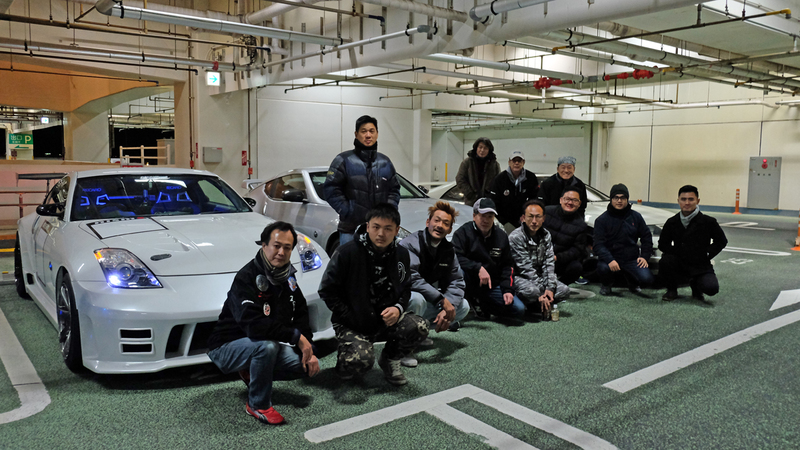 One of my friends and ‘amo,’ Wes Tsai, a Nissan Z-car fanatic, had established relations with the Z Project Tokyo Car Club, a group of Z-car owners dedicated to everything Z. For a car club that started in 1993, the group is expected to have a bunch of young, wild, and urban outlaw type of folks. 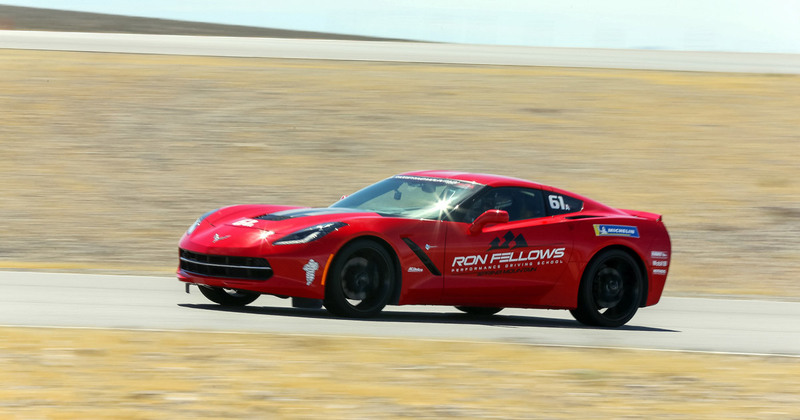 But in reality, many of them are successful businessmen and professionals in their late 30s to early 60s, and have not given up their passion for cars despite their busy lives and families. With 320 registered members in and around Tokyo, it’s a pretty big and organized group. They go on weekly informal cruises, and have a regular funrun once a month, with about 40 to 60 cars showing up. The Z Project Tokyo Car Club has agreed to be our host around Tokyo with Shinkichi Kanbayashi as our point person, a cool and friendly, suit-and-trench-coat wearing Tokyo Salaryman. When he’s not welcoming foreigner car nuts, Shinkichi is a senior executive at a leading multinational chemical company. So on the second day of Tokyo Auto Salon, we meet with Shinkichi, together with his friend and fellow Z Project Tokyo member Hiro Hatanaka outside Makuhari Messe train station. Shinkichi drives a black 370Z, with a basic intake and exhaust upgrade plus awesome Advan GT wheels, one of the hottest wheels at the moment especially for the Nissan GT-R R35 and 370Z. Hiro surprisingly drives a left-hand drive USDM-spec’d 370Z convertible complete with a Stillen Supercharger kit that bumps up power significantly. And did I mention that it’s convertible?! From Makuhari Messe, we head out to Daikoku first. Daikoku is a rest stop and parking area on Daikokufuto, a man-made island along the stretch of the infamous Wangan Bayshore Highway. Traffic is quite bad as it’s a busy Saturday so it takes us over an hour to get to Daikoku. We arrive relatively early at 8pm, so the place isn’t quite yet teeming but there's already a good number of interesting cars awaiting us: a Ferrari F360 convertible driven by a hot Japanese girl, a USDM-spec’d Nissan GT-R R35 brought by a Caucasian driver, and another GT-R R35 driven by an African-American. 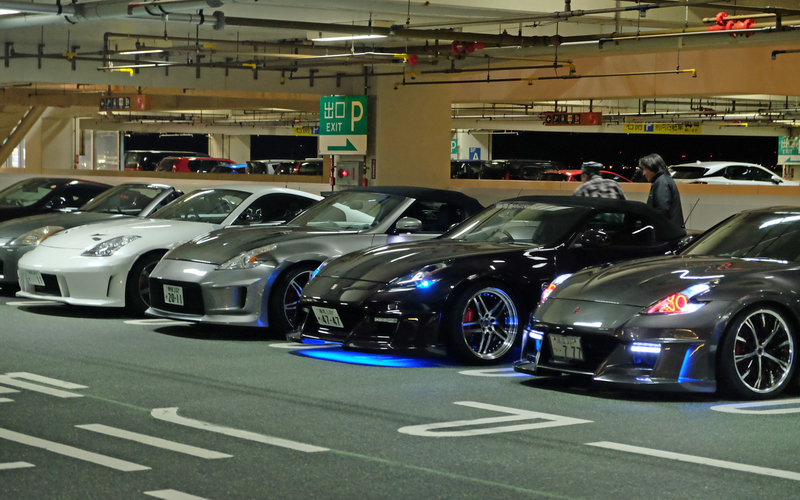 Of course, the Z Project Tokyo group arrives one by one. From an S30 Z to a 300ZX Z32 and a bunch of late-model Z33 350Zs and Z34 370Zs. I even spot a lonely-looking, track-spec time-attack RX-7 with numerous chips and battle scars. A quick look around the expansive parking lot reveals more hidden gems like a Hakosuka Skyline, a mint R32 GT-R, a Lotus, a VIP-themed Lexus LS plus a lot of other JDM-only oddities I failed to recognize. I am truly overwhelmed. A police car arrives at 9:30pm to sort of break up the party. Japan has strict anti-rally and illegal gathering laws, so the police break things up early (although things will most likely get back together later in the evening). 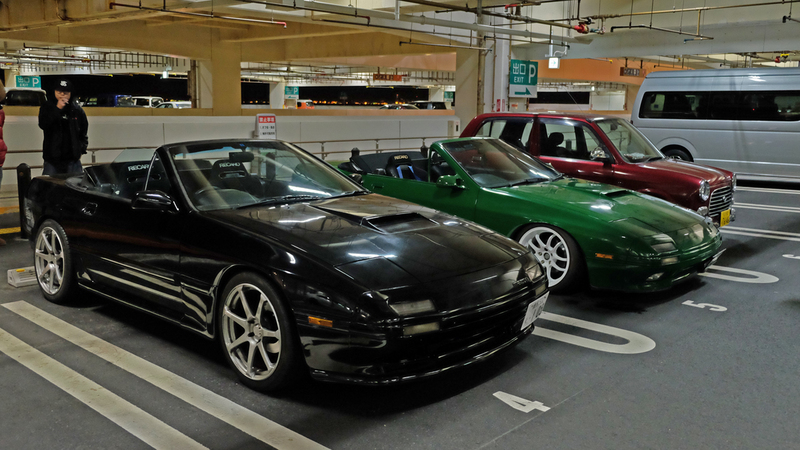 With about 30 cars strong, Z Project Tokyo decides to go to our next stop: Umihotaru Parking Area or Umiho for short. Umihotaru Parking Area is a man-made island parking area, with a food stop and shopping mall right smack in the middle of Tokyo Bay along the famous Tokyo Bay Aqua-Line Highway (the bridge-tunnel expressway that seemingly goes straight underwater on one end). Here, the club guys go a bit nuts, hitting over 200kph on their cars. Some in the group still have their 180kph speed limit so they fall easily behind but others have theirs modified and those blast past us, possibly going well over 230kph. We assemble at Umihotaru, park at the third level, hit the vending machines, light up and start taking more photos. 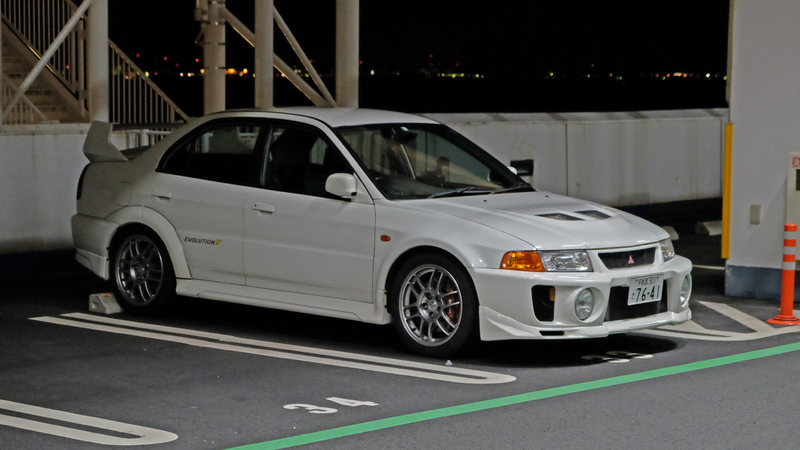 It’s still early, but we spot an EK9 Honda Civic Type R and a Mitsubishi Evolution V. Later, a duo of rare FC3S Mazda RX-7 convertibles park a few slots from us. We don’t stay long though, as the guys want to get a spot at Tatsumi Parking Area, the final destination for tonight’s jaunt. From Umihotaru, we head back toward Tokyo to Tatsumi parking area. Tatsumi is the smallest of the parking areas we've been, and it sits above the elevated Shutoko Highway, just off Route 9. 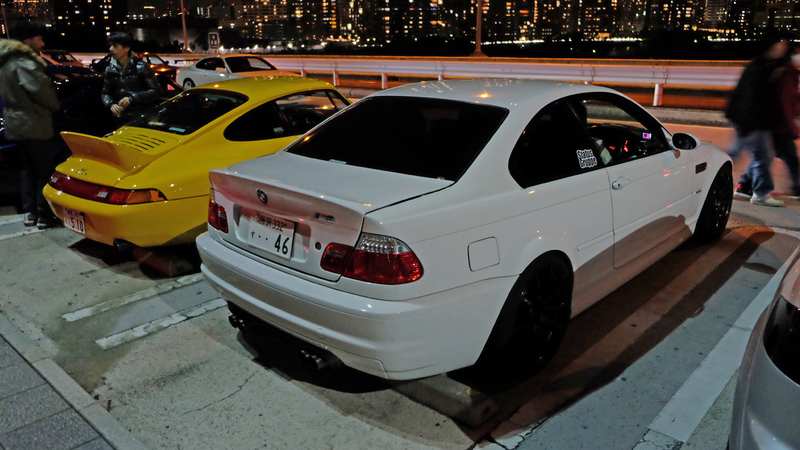 It’s infamous because of the number of people who blast at night on the inner loop, more popularly known among JDM anoraks as the C1, which loops around the Tokyo City Center. Many enthusiasts drop by Tatsumi parking area, so by the time we get there at around 11pm, it’s almost impossible to park. The area is pretty close to the sea and is elevated, and with little to no obstructions, it’s the coldest, windiest and loudest of all the locations we went to. And possibly the wildest. Cars are all over the small parking area. I immediately see a JZA80 Supra, a Porsche 964 and a BMW E46 M3 as we enter. While looping the parking lot, I spot a ST230 Toyota Celica, a Subaru Impreza STI, a Lancer Evolution VIII, a huge number of FD3S RX-7’s, a crew of second-generation Skylines (the R32, the R33, and the R34), a Ferrari Testarossa, a Lamborghini Diablo, more 997 Porsches, and so much more. 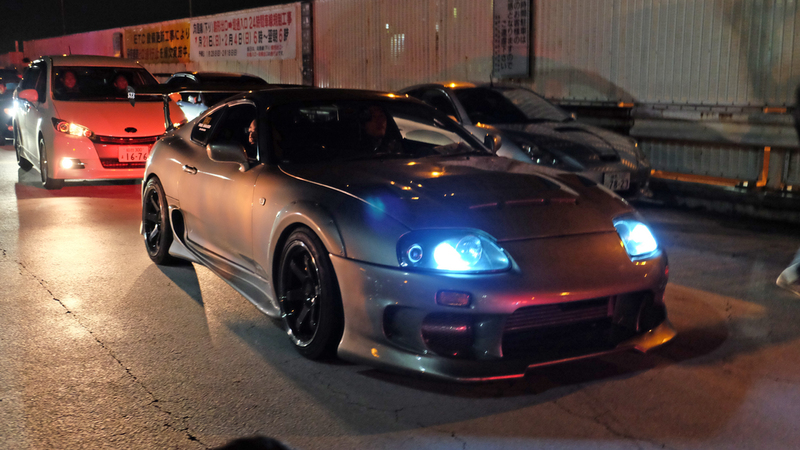 I’m very disoriented by the pure sensory overload that a Supra almost mows me down. But before I move away, I take a few photos and give the owner a thumbs-up, much to his surprise. There are also many gaijin taking photos, blogging, and vlogging. People are respectful and friendly, but also reserved. Later, I spot a crew of American muscle cars, which gives Tatsumi, and the rest of Japan’s car scene an international flavor. While exiting Tatsumi, cars line up and leave one at a time like models going down the ramp, strutting their stuff. And after every photographer and videographer is done taking their photos, the cars launch off into the distance at full-speed. Truly. An. Amazing. Sight. These three parking areas represent a typical night run route for many car guys. While many opt to stay within the C1 loop and drive as fast as legally possible, those who live outside Tokyo opt to go to these three parking areas to check out the scene. If you’re from the greater Tokyo area, you’ll most likely start at Tatsumi, then head out to Daikoku, followed by Umihotaru, then back to Tatsumi before calling it a night. If you live closer to Yokohama, Daikoku will be your first port of call. And if you’re coming from Kisarazu in Chiba, Umihotaru might be your first or last destination. We leave Tatsumi at around 12:30am (it is just too cold) with more cars coming in, but not before promising myself that I will come back, and (hopefully) rent my own car to drive at least around the C1 loop. Until next time, Daikoku, Umihotaru, and Tatsumi.